WhatsApp has just released a new update for iOS devices which comes with two new awesome features that will further enhance and improve the user experience and level of usability for iOS users. 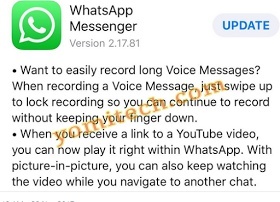 The latest WhatsApp update for iOS will now make it possible for iOS users to watch YouTube videos sent to them in a private chat or group message directly from the app without the need to launch the YouTube app. This new feature is not yet available to everyone but it's expected to roll out to all users soon. Another awesome addition included in the new WhatsApp update for iOS is Locked Recording. With this, users will now be able to record a message by tapping and holding the mic button until a small UI window appears that will allow you to lock the recording even when you pull your finger away from the screen. Once you are through with the recording, you can easily share them with your friends or in a group chat. The new features are already rolling out in latest WhatsApp update which is WhatsApp version 2.17.81.